Another interesting yet complicated transaction that was announced in 2014 and closing soon is the "double spin, double merger" of The E.W. Scripps Company (SSP, "Scripps") and Journal Communications (JRN) that will create one pure play broadcasting company and one pure play newspaper company from two mixed local media companies. Scripps is the larger of the two and owns 21 local television stations as well as mid-size and community newspapers in 13 markets. Journal Communications owns 14 television stations and 35 radio stations in 11 states, along with the Milwaukee Journal Sentinel and several community newspapers in Wisconsin. Following the completion of the transaction, both companies will have strong balance sheets compared to peers and will be in a position to continue consolidating their respective industries. 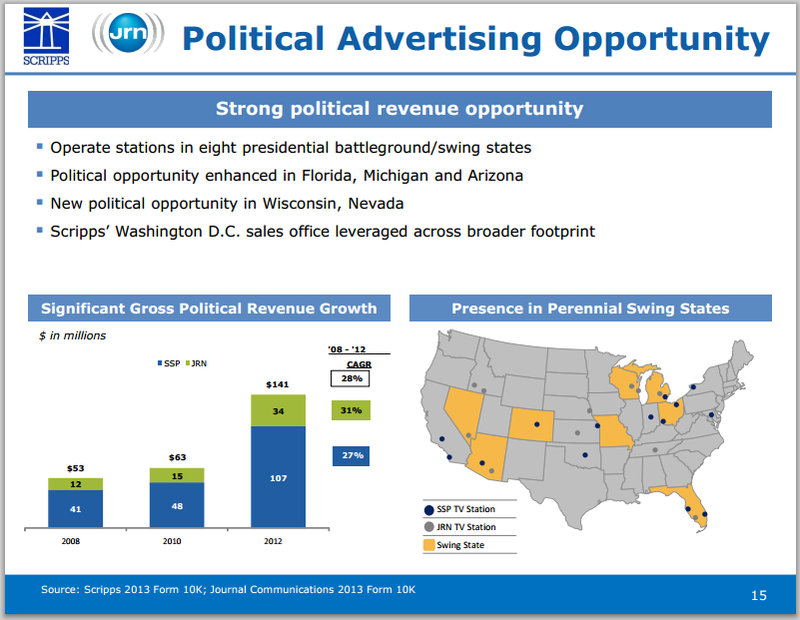 The new Scripps (the broadcast company) will be the fifth largest independent TV broadcasting company and will have dual tailwinds of increasing retransmission fees and 2016 political ad revenue in key swing states. The new Journal Media Group (the newspaper company) will have a net cash position, strong free cash flow, and will be in a position to make accretive acquisitions. Neither industry is incredibly exciting, I hate the local TV news, but there's a demo that still watches it regularly and it's the best medium for politicians to sling attack ads at each other. Warren Buffett has made investments in both industries in recent years and with the increased deal and spinoff activity, it's a natural place to look for ideas. On the closing date (early Q2), Scripps will spinoff their newspapers into the Scripps SpinCo entity, and Journal will spinoff its newspaper business into Journal SpinCo. Following the consummation of the spinoffs, the two newspaper spinoffs will merge to form Journal Media Group (JMG). All on the same day, Scripps will pay a $60MM special dividend to their shareholders and then merge the remaining Scripps and Journal broadcasting businesses to form the new Scripps as a standalone television and radio broadcasting company. Both companies will be free of cross-media ownership rules and could therefore pursue acquisitions in markets they were restricted from as combined broadcast and print companies. The new E.W. Scripps Company will own 34 television stations reaching 18% of households (well below the 39% FCC maximum), 34 radio stations, a few digital properties, and the Scripps National Spelling Bee. The Scripps family will maintain control over the new Scripps with 93% of the vote via the Class B shares. Scripps has shown prudent capital allocation in the past, they sold their cable business, spun-off the wildly successful Scripps Networks Interactive and bought back shares following the great recession. Controlling families aren't ideal, but part of the media landscape, there are worse families to be attached to than the Scripps. The local news seems to exist just to run political ads, Scripps GAAP profit alternates between windfall and breakeven every other year based on the election cycle. With no incumbent president and both parties moving more and more to the extremes, expect another big spending year in 2016. The new Scripps will have a strong political footprint with television stations in important swing states Florida, Ohio, Michigan, Wisconsin, and Colorado. Scripps will also have the tailwind of the controversial increasing retransmission fees, currently their fees are well below industry averages and will step up drastically in 2015 to $165MM. Cable companies, broadcast companies, and content companies are all in a race to consolidate in order to increase their leverage at the bargaining table. At some point the consumer is going to push back on rising cable bills, over-the-top options like Netflix and HBO-Go are already disrupting the industry to a certain extent. All things to keep in mind when considering retransmission revenue trends. Another advantage Scripps will have is a strong balance sheet with just 2x EBITDA in debt, whereas others in the space (Sinclair or Nexstar) are in the 3.5-5x EBITDA range. The company highlights their 18% market share and how it's well below the FCC maximum of 39%, I wouldn't be surprised to see Scripps add stations to its portfolio. For the new Scripps revenue is highly cyclical based on the election cycle, so it makes sense to take a blend of expected 2015 and 2016 EBITDA, I'm coming up with $263MM based on the joint proxy statement. Using a 8.5x multiple (average of the above comparables is 9.2) and ~$365MM in net debt, I come up with an expected market cap of $1.87B for the new Scripps. JMG will be a fairly simple business to analyze, it will have the flagship Milwaukee Journal Sentinel, roughly a dozen other smaller newspapers, no debt or pension shortfalls, and it will own its facilities and real estate. Basically the exactly opposite start that was granted a similar spinoff in Tribune Publishing (TPUB). It will be led by Timothy Stautberg, currently the head of the newspaper business at Scripps but who has a background in finance and was formerly the Scripps CFO. With the trend of newspaper consolidations and spinoffs (will likely lead to another round of mergers) it's a benefit to have a finance guy in the CEO role. JMG will be in a position to implement a similar strategy to New Media who have been successful at rolling up smaller weaker players at 2-4x EBITDA and having the market re-rate them higher. New Media likely gets a higher multiple due to the dividend retail crowd, I would anticipate JMG initially trading more inline with Lee Enterprises and McClatchy, but for conservatisms sake let's put a 5.5x EBITDA multiple on the company. Using 2015 projected EBITDA from the joint prospectus of $57MM, and a net cash position of $10MM, the projected market cap would be $326MM. Current Scripps shareholders will receive 69% of the new broadcast company and 59% of the newspaper company, plus a $60MM special dividend at closing. Using the valuations above, both JRN and SSP are modestly undervalued at this point. While there's not a ton of upside, there doesn't seem to be a lot of downside either considering both companies will be in a strong financial position compared to peers. I picked up some shares of SSP recently, I'm mostly indifferent between the two but it might be initially safer to hold proportionally more of the new SSP versus JMG which could be sold off after the transaction (possible opportunity) as newspapers continue to be out of favor. Expanding on the externalizing management theme, American Capital (ACAS) is a business development company ("BDC") that was an epic disaster during the financial crisis, it has somewhat recovered, but due to their NOLs the company has elected to not resume their dividend payments making it out of favor with the traditional BDC investor (muppet retail, dividend focused). On 11/4/2014, the company announced a long awaited plan to separate their asset management division (American Capital Asset Management, or "ACAM") from their traditional BDC assets by creating and spinning off two new BDCs with the remaining parent company, ACAM, becoming a pure play permanent capital asset management company. The two BDCs will then turn on the dividends making them more attractive to retail investors and ACAM will enter into highly valuable asset management agreements with the spinoffs. American Capital's shares trade for $14.50, a significant discount to their self-reported NAV of $20.50 (as of 9/30), which doesn't include the incremental value of the two new BDC asset management agreements to ACAM. The idea is well known among special situation investors and the separation of the asset management company from the BDCs has been well telegraphed, so why is it still trading at such a significant discount to it's NAV? I believe the many blowups in popular event-driven names in 2014 has caused managers to reduce exposure and the spinoff of two new BDCs is extremely complicated and has required more patience than many short term focused traders have been willing to give American Capital. For this situation to work out two questions need to be answered positively: 1) What will be the normalized run rate EBITDA for ACAM including fees received from the two new BDCs? and 2) Will the BDC spinoffs trade near NAV? And of course, this situation needs time to play out before another recession takes a bite out of American Capital's risky assets. American Capital was founded in 1996 and went public in 1997, ACAS is based out of the DC area and like other BDCs traditionally invests primarily in debt and equity of small and middle market companies who can't access capital through traditional bank loans or the corporate debt markets. BDCs like REITs are pass-through structures for tax purposes, if the BDC passes along 90% of its taxable income to shareholders its exempt from paying corporate income tax and instead the earnings are only taxed at the individual level (although at ordinary rates). Since BDCs have limited retained earnings, they need access to the capital markets in order to grow their asset base and increase fees to the management company. The ability to arbitrage their cost of capital against that of the assets they're purchasing can add value as the BDC turns illiquid risky assets into a liquid asset that appeals to retail investors reaching for yield. This arbitrage only works if the company's shares trade for above net asset value (NAV), otherwise equity issuances will dilute current shareholders and destroy value. Back to American Capital, from their 1997 IPO until the second quarter of 2008 the company's shares traded above NAV allowing the company to continually issue shares and grow their asset base. The great recession brought American Capital to the brink as their risky loans to mediocre businesses took significant losses (creating its net operating loss carry-forwards). The company turned off the dividends and sealed their fate with dividend focused retail investors as a toxic dump (that's still somewhat fair). American Capital's management knew they could no longer issue shares to grow and now had a valuable tax asset to monetize, so in 2011 they changed corporate structures switching from a regulated investment company (RIC) to a traditional c-corp allowing the company to retain its earnings. Retaining their earnings allowed them to repurchase shares in the years since the crisis at significant discounts to NAV and utilize their NOL position. Back to the current situation, after the proposed spinoff ACAS (ACAM) will become a valuable permanent capital asset manager with external management agreements with 5 publicly traded BDCs or mortgage-REITs, 3 private equity funds, and 5 collateralized loan obligations (CLOs). The management agreements with the 5 publicly traded vehicles are particularly valuable as they represent the holy grail of permanent capital, unlike open end funds investors can't withdraw their funds directly from the manager, they must sell their shares to another holder. In a previous post on another permanent capital asset manager, Ashford Inc, I was likely too conservative by backing into a 10x EBITDA valuation, this multiple is more accurate for a traditional open-end manager but the new breed of permanent capital managers are trading at higher multiples, closer to 14-16x as their fees are nearly annuities. Additionally, managers typically have a wide ability to push their expenses directly onto their captive vehicles and get fully reimbursed at full cost. Questionable? Yes, but in this low rate environment, many retail investors continue to pile into dividend focused vehicles as a bond substitute allowing managers to get away with exorbitant fees. 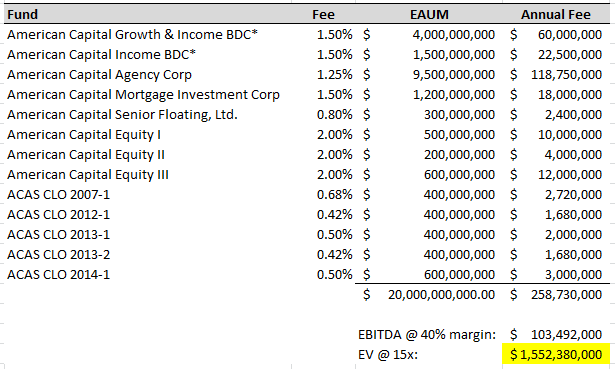 A couple of assumptions here, there are some moving parts with the two new BDCs and what the ultimate fee agreements will be, but I'm assuming a 1.5% fee on assets and ACAM only adding a little bit of leverage (when they'll probably add a lot more). Additionally, most of their vehicles have incentive fees, so you can layer that on top as well, and then I'm using a 15x EBITDA multiple, which one can argue is high but the permanent nature of their AUM deserves a premium over the typical fund manager. ACAM also has shown the ability to raise capital in different credit segments and aren't as concentrated to the shaky middle market as recent BDC manager IPOs have been. Additional Assets: ACAM will also be structured as a c-corp and will keep the $620MM in NOLs that were created by the poor investments within the BDC portfolio but will now be applied to the earnings stream of the asset management company, a nice bit of financial engineering and tax avoidance. In the investor presentation, ACAS guided to $1B in equity being available to the company, this appears to include the European Capital business ($680MM at NAV) which could be an additional spinoff in the future and also allows ACAM to seed new strategies before placing them in new public vehicles like they've done with American Capital Senior Floating (ACSF) in early 2014. The other key to this situation is determining what the new BDCs will trade at once the dividends are turned on and Seeking Alpha articles start getting circulated. BDCs are pretty terrible investments, they charge high fees and mask those fees with risky loans and high leverage, most retail BDC investors would be better off investing in a low cost stock/bond mix and peeling off their own "dividend" by selling shares. There is a noticeable bifurcation in valuation between internally and externally managed BDCs with the internal ones selling a sizable premium to NAV where the external BDCs are lucky to trade at NAV. I don't have a lot to add specifically regarding the new BDCs. American Capital Growth & Income will include the operating companies (thus able to be a tax-free spinoff) paired with the syndicated bank loan/CLO equity portfolio where they'll use all their available leverage and pile on debt. Bank loans generally held up during the great recession and belong in a permanent capital vehicle instead of a traditional open end fund or ETF. I could see this larger BDC transforming into something like their ACSF vehicle, syndicated bank loans are more transparent and easier for ACAM has a manager to service. American Capital Income will have their third party middle market type loans, nothing particularly interesting about it, but the key is both of these BDCs will start paying "market rate" dividends. In a record low interest rate environment, retail investors will continue to flock to BDCs as a fixed income replacement, once American Capital's BDCs start paying dividends they should trade near NAV or just below. Adding up ACAM and the BDCs, I come up with a total valuation of $6.1B, or $23 per share, above the $20.50 estimated NAV because of the two new asset management contracts and a higher permanent capital manager multiple assigned to ACAM. It should be noted that ACAS has over 54 million in options outstanding at an average exercise price above $9 per share, ACAS will probably cover some of this dilution with share repurchases, but that will knock the $23 estimate down a notch or two. American Capital is a combination of a few themes that I like right now: (1) it has a complicated structure and balance sheet that doesn't screen well and requires some work to dig through; (2) the remaining asset management company will be a c-corp (versus a partnership, no K-1s, widens the investor base) with a significant NOL tax asset; (3) it's a company that currently doesn't pay a dividend in a dividend focused sector, essentially getting punished for displaying rational capital allocation; (4) and of course it's about to embark on a break-up/spinoff which will force the market to value it on a sum of the parts basis (and create AM agreements with two new BDC vehicles). I'm more interested in the asset management company for obvious reasons, but one might need to hold onto the BDCs for a quarter or two after the spinoffs to give time for the market to re-rate them inline with peers. I bought a mid-sized position this week around $14.40, will look to potentially supplement my shares with LEAPs as well.